"North Coast Boomerangs recruiting march"
During World War 1, there were numerous recruiting marches... all but one of which, was in NSW... the exception being the Dungarees, which commenced in Warwick and ended in Brisbane. The idea was to inspire/encourage young men to join the armed services. To many who had never left their district, the possibility of travelling the world, must have seemed an opportunity too good to miss. Little did they realise just what they would be facing. My own grandfather joined one of these marches... but this story is about the North Coast Boomerangs, also called the Coastal Boomerangs.
" Route: Grafton, Woolgoolga, Coffs Harbour, Nambucca Heads, Macksville, Kempsey, Telegraph Point, Port Macquarie, Taree, Bulahdelah, Raymond Terrace, Maitland. 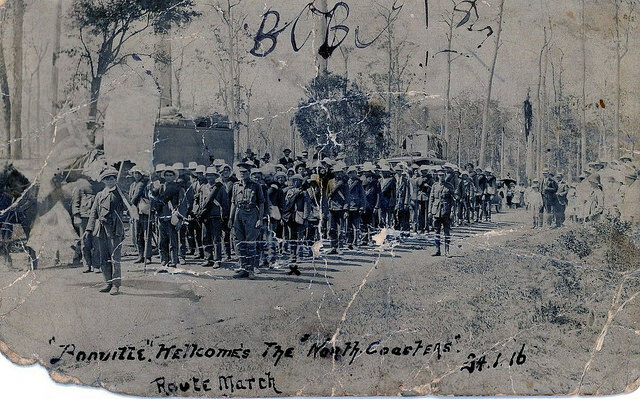 The ‘North Coasters’ started with only 27 men but gained 80 recruits at Coffs Harbour and, by the time they reached their destination, had 240 men – almost a 9-fold increase. In addition, it was estimated that over 500 men were induced to volunteer as a result of the march. It's a great story, isn't it. I often wonder if there is a list of how many who joined via the marches returned home. Hi June, glad you dropped by... I take it you mean the 1950s.. typos are the bane of my life, so you're in good company. There is so much coming to light about Urunga... love our little home town. WHO WOULD HAVE GUESSED, FIVE ALREADY!